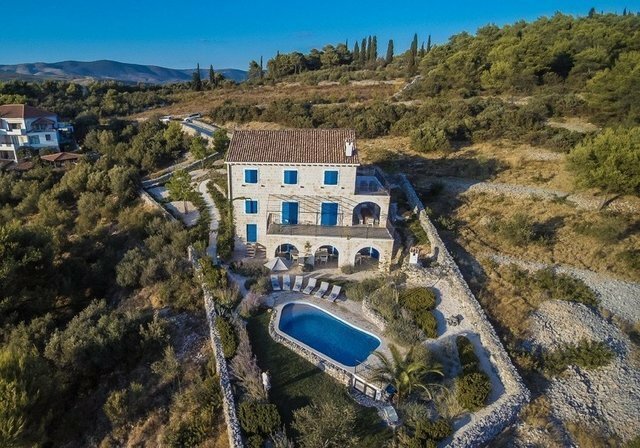 This stunning, classic villa is situated in a unique location which provides a panoramic view of the sea. It sits proudly on the island of Čiovo, which is connected to the mainland and the town of Trogir via a bridge. The centre of Trogir is just 1.3 kilometers away and it is possible to walk that distance, making the villa easily accessible on foot. The sea shore is 600 meters away; furthermore, there is a popular commercial beach with numerous features nearby. Close proximity to the airport (just 7 kilometers) represents yet another advantage. The villa sits on a 1,047 square meters lot that also includes parking space, a beautiful garden and a 35 square meters swimming pool. The total net residential area is 355 square meters. It consists of a backyard-level ground floor, parking space and access road-level second floor, a third floor and a gallery. The ground floor includes a wellness and spa area for massage and relaxation, a kitchen and a bathroom. The second floor consists of an entry hallway, a living room with a dining room and a kitchen, a bathroom and a spacious terrace. The third floor consists of a hallway with a washing machine, two bedrooms, a bathroom and a bedroom with its own terrace. This floor also contains a terrace. There is also a gallery with six beds and a bathroom. Each floor is linked by an indoor staircase, while the ground floor and the second floor are also linked by an external staircase. There is a total of three entrances to the villa. The neighborhood is practically vacant, guaranteeing peace and privacy. The four-star villa is currently being let out to tourists. The famous Croatian dry stone walls were rebuilt in the traditional technique, forming boundaries to the plot. A famous French designer was in charge of interior design and the furniture was imported from France. The external walls were constructed using renewed old stone blocks that had previously been used to build a historical house in inland Dalmatia. The photographs show that the villa is exquisitely tastefully decorated and special attention was paid to every detail, but the villa shows its true potential when visited in person. This is a true oasis of peace, equally suitable for personal use and for tourist accommodation.